BARCELONA – March 28, 2018 - As part of the largest implementation of TVU Networks’ gear in Egypt, the Cairo-based Arab News Agency (ANA) purchased more than 55 new and upgraded IP video equipment such as TVU One mobile IP transmitters and TVU Transceivers for its newsgathering operations. ANA will use TVU Networks equipment exclusively for all its cellular uplink and video delivery needs, including IP streaming. ANA is a premier media production provider in the Middle East with a reputation for high-end technical innovation. The company provides media services, including newsgathering and distribution, to broadcasters in the Middle East and North Africa. TVU Networks’ equipment reseller in the Middle East, Broadcast & Studio Solutions (BSS), coordinated the sale. ANA conducted a thorough competitive evaluation before switching from its previous cellular uplink providers to exclusively TVU Networks. According to Sonbol, one big benefit in TVU’s favor was the cost-savings of TVU Grid, TVU’s IP video switching, routing and distribution solution. With TVU Grid-enabled transceivers, ANA will reduce costs over its previous SNG set up, which required an on-site engineer, technician, camera crew, large amounts of equipment and the procurement of satellite time. With TVU Grid, a broadcaster can take a live video transmission from one location and share it with any number of Grid enabled stations in the world. TVU’s Transceivers power TVU Grid. Sonbol also cited the ease of updating with TVU. When the time comes to upgrade ANA’s TVU equipment, it can all be done remotely as software updates compared to other vendors’ hardware-only updates. With TVU Grid, a broadcaster can take a live video transmission from one location and share it with any number of Grid enabled stations in the world. TVU Grid enables stations to take any video source, whether it be a SDI feed, IP video camera, Internet video, or a TVU transmitter and distribute the live video stream to any number of other Grid enabled locations with sub-second latency. TVU Grid’s simple to use interface gives users control over the switching and routing of video streams from anywhere on a network of Grid enabled locations. The TVU Transceivers can accept multiple video streams from any IP-based video source as well as any TVU Networks video transmitter. TVU Transceivers offer an optional feature that allow users to take a live TVU transmission and output it to a third-party website or CDN. The live video is encoded into an IP format and can be sent to up to six different remote locations. Integration with Facebook Live can be added to TVU Transceivers for live video streaming to the network. The TVU One live mobile IP transmitter with integrated HEVC compression replaced DMC’s existing TVU mobile units. Featuring TVU’s patented Inverse Statmux Plus (IS+) transmission algorithm, TVU One can deliver HD quality video with half-second latency at 3Mbps. It can transmit simultaneously over multiple mediums, including cellular, microwave, satellite, BGAN, WiFi and Ethernet. Already in use by thousands of leading broadcast organizations around the world, the TVU Networks family of IP transmission solutions give broadcasters and organizations a powerful and reliable tool to distribute live video content to broadcast, online and mobile platforms. The TVU Networks suite of solutions has been used to deliver professional-quality live HD footage of a number of important events around the world including the World Cup, both Summer and Winter Olympic Games, U.S. presidential elections, natural disasters, the 2013 Papal conclave, the Super Bowl, the 2015 Papal visit to the United States and several international sporting events. For more information about TVU Networks solutions, please visit www.tvunetworks.com. Arab News Agency (ANA), with its headquarters in Cairo, is a pioneering and leading establishment in the field of media production, provision of media services, newsgathering and distribution, digital development and TV marketing in the Middle East. Since its inception in 2006, its target has always been the positive and effective engagement with its customers, responding to their needs, proposing imaginative ideas and providing new solutions to improve the quality of their productions. In 2012 the ownership of ANA changed hands to become part of the Future Group for Media and Communication. And since that date the Arab News Agency (ANA) has gradually progressed to become the leading provider of media services and video content in the region. The ANA has consolidated itself by acquiring the services of seasoned professionals in the areas of Media Services and Media Production. ANA has managed to trust of its clients by imposing a high level of professional standards and ethical conduct. TVU Networks® is a technology and market leader in IP-based live video solutions. TVU’s solutions help transform broadcasters’ SDI-based operations - which include acquisition, transmission, routing, distribution and management - to an IP-based infrastructure. TVU® serves customers of all sizes in more than 85 countries from industries that include news broadcast, web streaming, law enforcement, sports, corporate and government. In broadcast markets around the world including the USA, China and other major economic powers, TVU® is the dominant market leader with a large majority of all news broadcast stations using its IP video solutions. 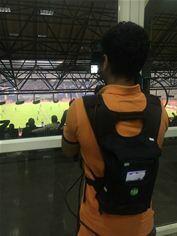 Using its proprietary IS+ technology, TVU’s uplink solutions use any combination of cellular, satellite, microwave, WiFi and Ethernet IP connections to deliver live HD video from practically any location.